Support your favorite University of Oklahoma Sooners by displaying this two-sided University of Oklahoma logo premium 2-sided garden flag. This 13" x 18" flag is made of durable, heavy-duty 150-denier polyester and has a 1" pole sleeve so it's easy to hang! 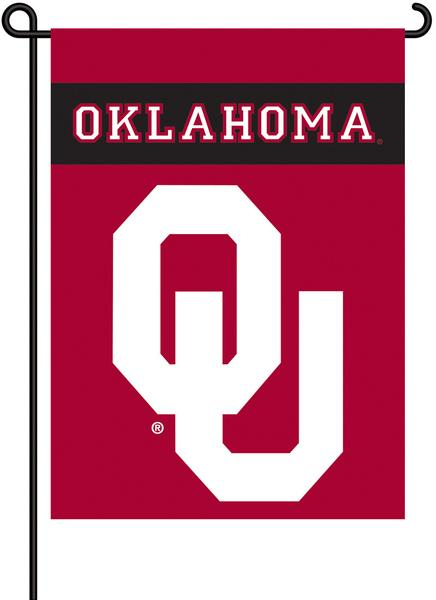 The officially licensed Oklahoma Sooners banner is brightly decorated in true OU colors, and proudly displays the official team logo on both sides. The flag also includes a free plastic pole with suction cups for hanging in a window!